Convert PDF files to editable Numbers, Keynote and Pages formats on the iPad using iPad PDF converter - PDF2Office for iWork. PDF2Office for iWork converts PDF to Keynote, Pages and Numbers on the iOS. 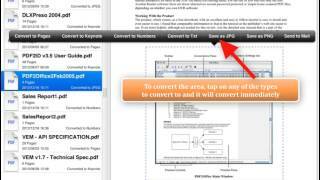 Convert PDFs to editable formats on the iPad increasing productivity. 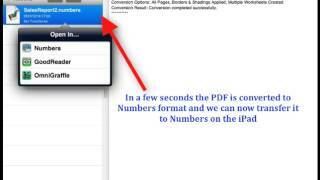 With this tutorial, we want to show how you can convert a PDF to Numbers format on the iPad using PDF2Office for iWork, iPad edition. PDF2Office for iWork, iPad edition is a PDF conversion and viewing app for the iPad. PDF2Office for iWork converts PDFs to Numbers, Keynote and Pages format on the iPad. Here we have the PDF2Office for iWork application running on the iPad. We see on the left hand side that there are bunch of PDF files listed in the Documents list within PDF2Office for iWork. Tapping any file in the Documents area, shows the PDF preview of the selected file. Lets start converting PDFs to Numbers format on the iPad. To convert a file, tap to select it. Then tap on the format button, listed at the bottom to specify the type to convert to. Lets tap on Numbers in this case. Finally we want to tap “Convert”. PDF2Office starts converting the file and in a few seconds we now have a Numbers file. Notice how PDF2Office automatically changes the view so that your PDF files aren’t listed but just the converted files. Now that we have a Numbers file, we can transfer it to Numbers on the iPad to edit and modify it. We tap to select the converted output and see that the “Open In..” panel appears. Just tap on Numbers and the file is immediately transferred to Numbers and Opened. Numbers displays a tip. We can just dismiss it for now. We now have a fully editable Numbers file with all text live and editable. PDF2Office for iWork also converts to PDF to the Keynote and Pages format allowing you to recover and reuse your PDF contents on the iPad. PDF2Office for iWork, iPad edition is available from the App Store.